This two-bedroom apartment in Old Montréal features elegant décor with modern chrome accents. The open-concept living space includes a fully equipped kitchen, a six-person dining table and a smart TV. The apartment comes with ample closet space and large windows that let in lots of light. It has two pristine bathrooms: one with a shower, and the other with a combination bath and shower. Without a doubt, the highlight is the huge furnished balcony that serves as a second lounge area and dining room in the warmer months. Penny Lane is a brand-new condo development by Europa with a total of 59 units. The historic building was previously known as the Hôtel Ottawa in the 1860s, and the developers were careful to preserve its classic Victorian style while giving it a contemporary flair. 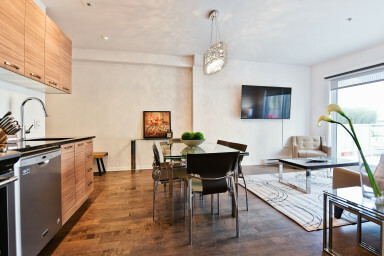 Located at the corner of McGill and St-Jacques street, this apartment is at the heart of the stylish and buzzing Old Montréal. With a perfect walk score of 100, your every heart’s desire is within arm’s reach, from the central train station and the financial district to the best brunch spots and the trendiest boutiques. Check out foodie hotspot Olive et Gourmando for a lunch to remember and swing by Rooney to shop timeless apparel by independent designers. And if you’re the bookish type, you’ll love browsing the shelves at Librairie Bertrand. There’s something for everyone.